Air source heat pumps take stored solar heat energy from the air outside and use it to heat your home and to provide domestic hot water. Air source heat pumps work in a similar way to refrigerators; which makes the food inside them cold, by extracting the heat from it. Air source heat pumps which operate as air to water systems qualify for tariff payments under the Domestic Renewable Heat Incentive, or Domestic RHI which was introduced by the Government in April 2014. The Domestic RHI was introduced to encourage the uptake of renewable heat energy systems such as biomass boilers, solar thermal water heating systems, ground source heat pumps and air source heat pumps. Air to water air source heat pumps distribute the heat they generate through standard central heating systems and radiators which are filled with water. Whereas air to air air source heat pumps distribute the heat they generate through a warm air heating system. Air source heat pumps merely move the heat from the air outside to the central heating system in your home, rather than extracting heat from fossil fuels by burning them. This makes air source heat pumps very efficient because for every one kilowatt of electricity the heat pump uses, between three and four kilowatts of renewable heat energy is generated. Air source heat pumps require very little in the way of maintenance and in terms of working parts they only consist of a pump, an evaporator, a compressor and a condenser. This means that operationally, air source heat pumps are very reliable. Air source heat pumps are also a reliable source of heat because they are capable of heating your home and providing hot water even when the temperature of the air outside is as low as -15º C.
In addition, air source heat pumps are not affected by the amount of sunlight there is (as in solar thermal and solar PV systems), or by the rising cost of LPG and heating oil. The Domestic RHI scheme was introduced by the Government in April 2014 encourage householders to switch from fossil fuels to renewable forms of energy such as air source heat pumps. Air source heat pumps attract Domestic RHI tariff payments of 7.3 pence per kilowatt hour of renewable heat energy they generate and a typical four bedroom house could have an annual heat demand of around 20,000 kilowatt hours. This would result in annual Domestic RHI tariff payments of £1,460 (20,000 kWh x 7.3p/kWh = £1,460.) which are guaranteed for seven years. In addition to this, the Energy Saving Trust has estimated that for a typical four bedroom house switching from LPG, air source heat pumps can save around £600 on annual heating bills. Who can claim Domestic RHI tariffs? 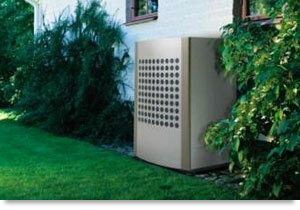 Air source heat pumps are about the size of a domestic air conditioning unit. Apart from the heat pump, they contain an evaporator, a compressor and a condenser and they sit on an outside wall. The pump passes air from outside over a series of pipes containing fluid. The fluid absorbs heat from this air and the heat is transferred to a refrigerant by an evaporator. The evaporator changes the fluid from liquid to gas which is then compressed, causing it to heat up. This heat if then transferred to your home heating system by a condenser. Once the original fluid has given up its heat, it is returned to the heat pump in the box outside to be reheated and for the process to continue. The cost of an air source heat pump for a typical four bedroom property should be between £8,000 and £10,000. They are less expensive than ground source heat pumps because they do not need a ground loop which has to be buried in a trench in your garden. This however, is reflected in the Domestic RHI tariff payable; 7.3 p/kWh for air source heat pumps compared to 18.8 p/kWh for ground source heat pumps. Running costs for air source heat pumps include the cost of electricity required to operate the heat pump but this should not be much more than the cost of running the pump in a central heating system which uses LPG or heating oil. An ideal set up for a domestic property would be an air source heat pump which provides space heating and solar thermal which provides domestic hot water. Although householders can only apply for Domestic RHI tariffs for one space heating system they can make two applications if one is for a heat pump or a biomass boiler and the other is for a solar thermal water heating system for domestic hot water. Lower heating bills than LPG, heating oil, coal and electric storage radiators. Lower carbon dioxide emissions. For a householder with a typical three bedroom house, switching from electric storage heaters or a coal-fired heating system this can be as much as five tonnes per year. Air source heat pumps cause less disruption than ground source heat pumps because there is no need for an expensive ground loop to be installed in your garden. Air source heat pumps are simple to operate and having no complicated moving parts they require little in the way of annual maintenance. Air source heat pumps require very little room on an outside wall and in most cases they can be connected up to your existing central heating system’s network of pipes and radiators. With air source heat pumps there is no need for deliveries of heating oil, LPG or solid fuel. Domestic RHI tariff payments guaranteed for seven years if you install an air source heat pump. Air source heat pumps are exempt from the need for planning permission, although if you live in a listed building or in a conservation area it would be worth confirming this with your local planning office. Air source heat pumps are eligible heating technologies for the Green Deal so you may be able to obtain a Green Deal loan to contribute to the cost of installation.